I noticed to today that the St.Marys Church Yard revamp is coming on a pace. Does anyone have any illustrations of what it will look like when it is finished? I've asked for a link...will post asap. Not sure whether this is just a concept or the final scheme, but this image was on the press CD distributed at the development partner announcement. The following image has been sent to me by the developers:watercolour_render.jpg but I dont know if I've posted it right...I'll download it myself and THEN try..not too technically savvy I fear. Jackie - you can email it to me if you want and I'll upload it for you. BUT trouble is, the picture is very pretty but doesnt really show a lot and the CGI is also rather vague. Is there going to be a playground is my most important question..will ask the powers.. 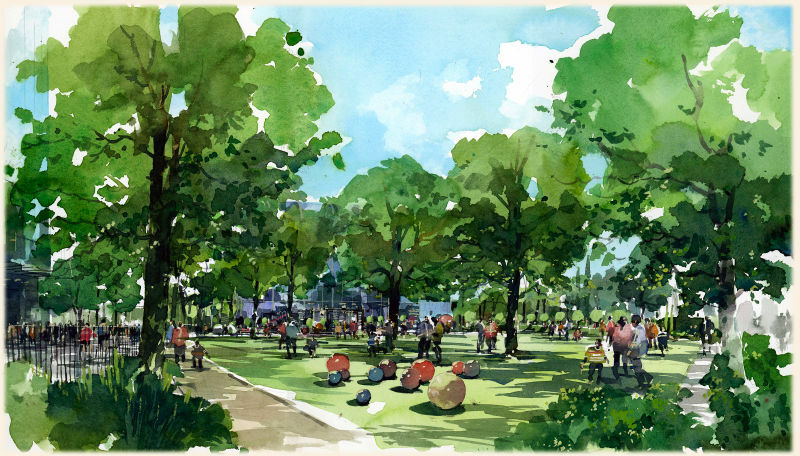 Yes, there will be a playground, according to the London Development Agency (they're funding the churchyard works). Does anyone one know how long the work is expected to take?